Contestant! Come on down! It’s time to play Spin a Win mobile slots and YOU are the star of the show! Take your seat, the game is about to begin. Your fellow contestants and our charismatic host are ready and waiting on the reels; it’s time to play Spin a Win. Spin a Win is an mFortune Casino exclusive game that puts you in the spotlight for a retro TV spectacular. Fixed to 20 win lines, this vibrant mobile slots game features a mini-game where you’re guaranteed a win, and there’s a huge progressive Jackpot waiting to be won. All you need to be the star of this mobile slots gameshow is a device running iOS 10 or Android 5 and above, along with a WiFi or data connection. You can also play it online via your desktop or laptop computer. Ready to play? Lights, camera, ACTION! The stage is all yours, so let’s get started with Spin a Win mobile slots! Just tap ‘Play Now’ from the game menu, and start by setting your bet-per-line. Spin a Win is fixed to 20 win lines, so this is the only value you need to set. Tap ‘Bet’ and use the ‘+’ and ‘-‘ to set this, and the amount displayed next to ‘Total Bet’ will change automatically. Your ‘Total Bet’ will be your bet-per-line multiplied by 20, the number of win lines in play. For instance, betting the minimum of 1p a line will give you a total bet of 20p. The maximum you can bet is £10 a line. When you’re ready to play, tap the floating arrow. If you need to concentrate on the show, we’ve included a handy ‘Auto Spins’ feature. Tap ‘Bet’ and choose ‘Auto Spin’, and the reels will spin in on their own. Choose a number of spins, a credit limit, and a maximum bet amount and then tap the arrow to spin. The Auto Spins will end when you run out of spins, hit one of your limits, or tap ‘Stop’. In the Spin a Win gameshow, how will you know if you’re on to a winner? That’s easy! Wins always pay from left to right, and both your winning lines and prize amount will go up in lights…well, they’ll be highlighted on the screen at least! To win, you’ll need to spin in a winning combination of symbols. With some, two or more will do it. For others, you’ll need 3 or more. Spin a Win and you’ll bag a multiplier of your original bet-per-line! All the information you need on these combinations – and the multipliers they award – can be found in the paytable. This is the gameshow that keeps on giving, which is why it’s possible for you to win across multiple win lines with a single spin. These multipliers will be added together before being added to your credit. We don’t want you to throw a diva strop like our host, but only the highest single win-per-line will be paid. Like all good gameshows, Spin a Win has a wildcard. Well, it’s actually a Wild symbol and Wilds could help you turn a losing spin into a winning one by substituting for most other symbols on the reels. Here’s how they work! Say you spin in two contestant Kate symbols alongside a Wild. The Wild will substitute as a Kate symbol, and you’ll win the multiplier for x3 of this red-headed contestant! Wilds can’t do everything though. They won’t substitute for the Mini-Game and Free Spins symbols, and it’s not possible to win the Spin a Win Jackpot where a Wild lines up with the Jackpot symbols. To take home the star prize, you need to spin in five Jackpot stars on an active win line. No gameshow is complete without a wheel full of prizes, and that’s exactly what you can find with the Spin a Win mini-game! Spin a Win activates when you spin in 2 or more wheel symbols on an active win line. Around the wheel, you’ll see coloured segments with multipliers. Some may be higher, some may lower, and all you need to do to try and win one is tap the floating arrow to spin the wheel! As you do, the inner and outer wheels will spin before coming to a stop at random. You’re sure to win a multiplier even if the inner wheel lands on a red. But if the inner wheel stops on a green segment you’ll win the multiplier displayed on the outer wheel and spin again. This continues till the inner wheel stops on a red segment. When it does, you’ll collect all your prizes so far and exit to the main reels. The more mini-game symbols you line up on the reels, the more green segments on the inner wheel. mFortune’s gameshow host is a pretty generous guy, and he’s loaded up Spin a Win with a Free Spins symbol that could see you win big without spending a penny. Spin in 3, 4, or 5 Free Spins symbols anywhere on the reels and you’ll receive 8, 15, or 30 free spins respectively! As the host is footing the bill for these, you can sit back and relax ‘cause your credit isn’t touched. Any free spins lock to the bet-per-line of your last paid-for spin, so you won’t be able to adjust this value until your free spins have ended. Ready to take your seat and see if you can ace mFortune’s very own gameshow? Play Spin a Win today and see what you win! New to mFortune? Welcome! Register for your first and only account today, and grab a no deposit welcome bonus of £5*! Play today! *18+. New players only. All bonuses awarded as bonus credit. 100% deposit match of first deposit, up to £100 and paid as bonus credit with a 1x wagering requirement. Bonus credit cannot be withdrawn. Max withdrawal without depositing is £200. You can withdraw any unspent deposit, in addition to the funds in your cashable credit account. T&Cs apply, BeGamble Aware. The occurrence of 5 (five) “JACKPOT” symbols on an active win line awards the progressive Jackpot. The progressive Jackpot is available on any bet, with 0.005% of the bet being added to the progressive pot. There is no hidden reserve pot. When the Jackpot is won it is reset and begins to rise again. Simultaneous wins can occur. If another player wins the progressive Jackpot then a notification to this effect would occur BEFORE the current player was awarded the Jackpot. The game Jackpot seed value is £2000. The Jackpot is individual for this game, it is not shared with any other games. In the event of a communication error after a progressive win result has been determined and before it has been displayed on screen, the win amount will automatically be transferred to the player’s account. While the game is live the Jackpots cannot be terminated. 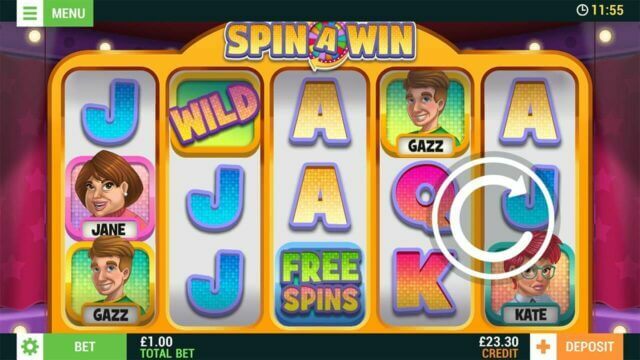 Spin a Win mobile slots has a theoretical return to player of 94.6%. This is based on long-term playback. System malfunctions void all payments. Monies are staked in the following order: winnings, player deposits, bonus credit. mFortune general terms and conditions apply.